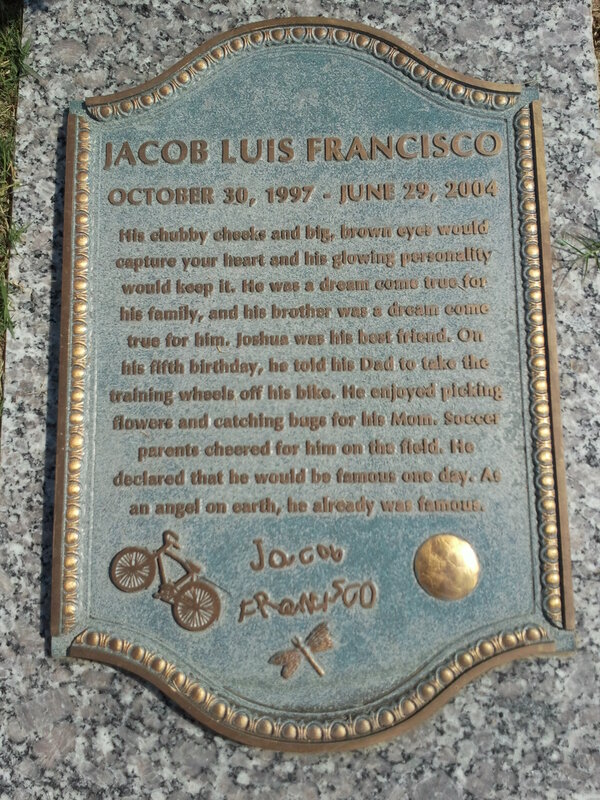 Jacob Luis Francisco was a healthy six year-old boy who lived in Johnson City, Tennessee. He loved to ride his bike, to pick flowers and to catch bugs for his mother, to read books and go to school, and to play with his little brother. One day he spontaneously declared to his mother, “Some day I’m going to be famous!” When questioned for what would be his fame, he replied, “I don’t know, but I’ll be on the covers of magazines.” A few months later, this gregarious little boy got very ill and died within two weeks of showing the first flu-like symptoms. On a Wednesday in June 2004, Jacob started feeling sick and had a low-grade fever. He rested Thursday and on Friday was feeling better and he was again playing outside. On Friday evening, he complained of stomach cramps and began diarrhea through the night. In the early morning Saturday, his parents noticed blood in his stool. They immediately took him to Jacob’s pediatrician, who ran some tests. At that time the physician would not say what illness Jacob was suffering. Due to an uncertain diagnosis, he did not prescribe any antibiotics or other medicine. The physician instructed Jacob’s parents to take him home to get plenty of rest and to encourage fluids, and to return on Monday for the test results. The family endured a rough Father’s Day, and returned Monday to receive the diagnosis that Jacob had a Shiga Toxin-Producing E. Coli (STEC) infection. Jacob was again sent home and to return the following day since the pediatrician believed that he was better-hydrated and would be more comfortable. The family has since learned from visiting lecturers at ETSU Quillen College of Medicine that Jacob should have been immediately hospitalized for IV hydration and quarantined upon the first suspicion of STEC infection. Jacob returned to the pediatrician on Tuesday, who then admitted him to the hospital. It was discovered that Jacob had lost 30% of his kidney function due to Hemolytic Uremic Syndrome (HUS). He was eventually put on dialysis, and induced coma due to adverse reactions. The STEC had spread to infect every organ of Jacob’s body. His parents remember his last tearful words that he just wanted to go home. The next night about two o’ clock in the morning, Jacob passed away. Despite investigations into all the food that Jacob could’ve eaten, where he had been, or where he contacted water during the ten days prior to his first symptom, the source of the E. coli bacteria that infected Jacob is unknown. For this reason, it is so important to know that dangerous E. coli bacteria can be found in food and water, and to try to eliminate it, or at least work to reduce its prevalence. Through Jacob’s Project, the public will be more aware of how an E. coli bacteria infects a human, and that it is the #1 cause of renal kidney failure in America’s children. Since establishing Jacob’s Project, many local survivors have shared their existence with the Francisco family and have offered their support. As a result of the collaboration behind Jacob’s Project, families will be better-informed to prevent contamination and lives will be saved. Jacob will be famous for saving lives.